When it comes to solving a problem, humans aren’t always inclined to sprint directly towards it. But at Aspire Ventures, that’s exactly what we’re doing. If you’ve been following our blog, you know that the Aspire team has been supporting venture Tempo Health in their endeavor to leverage machine learning technology to help diabetes patients manage their glucose levels with a mobile application. Over the past few months we’ve pooled our collective resources to develop predictive models that can provide more accurate glucose readings and produce more accurate predictions of future glucose levels. Leveraging our machine learning tools, the Aspire science team has developed a software-driven approach to glucose monitoring, dubbed Soft CGM, that reduces the noise of current continuous glucose monitoring devices. It does so by applying unique algorithms per patient according to their unique data to automatically find the best path to accuracy. The result, in short, is a new diabetes management solution that could give continuous glucose monitoring capabilities without CGM hardware. The challenge: How do we get this technology into the hands of consumers with an easy to use application? To address that problem, this week we entered a process known as a Design Sprint, where we’ll dive into critical business questions, design a product, build a prototype, and test it with customers—all within five days. This regimented method of rapid design and prototyping, originally developed by Google Ventures, is a tried and true way for start-ups to quickly develop ideas and learn about their potential outcomes. The process will conclude on Friday with testing, where diabetes patients can test our prototype and provide feedback during a webinar on Friday at 1:30 p.m. The webinar is open to anyone with type 1 diabetes. Our application will be especially targeted for diabetes patients who are on insulin and who don’t use Continuous Glucose Monitors. To meet the design challenge, we’ve assembled a cross-functional team with members representing research and analytics, marketing, data science, software architecture, software development, and business perspectives. 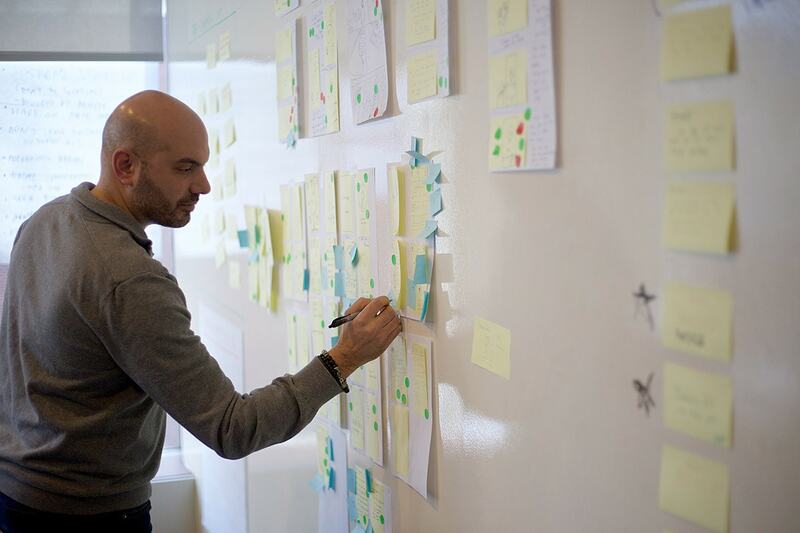 On day one, the Design Sprint team examined the problem to gain a fuller understanding of the market, the consumer’s needs, and all of the challenges in meeting those needs. “The simplest way to describe it is how do we create something that is everything diabetes patients love about CGM but nothing that they don’t,” says Marcus Grimm, Aspire’s Chief Marketing Officer and a diabetes patient of 31 years. According to Grimm, consumers like how CGM systems help them understand their blood sugar trends, but they don’t like the cost and the burdensome sensors. “So the goal here is, can we find a way to tell people what direction their blood sugar is going without exactly measuring their blood sugar?” Grimm says. There are at least 24 factors that influence blood glucose levels, but many of the bolus calculators on the market today only look at four or five of those factors. The goal of developing a Soft CGM application, Grimm says, is to utilize measurements of a broader set of factors, which can be provided by fitness trackers and other common personal devices. That data can then be plugged into our machine learning algorithms in order to give blood sugar readings without CGM hardware. On the second day of the Design Sprint process the team brainstormed to come up with a number of different ways to tackle that challenge. Today, the third day, they’re honing in on one solution. The Design Sprint team will then draw up a blueprint in preparation for the fourth day, when they’ll actually develop the prototype. Finally, after an intense day of development on Thursday, our team will have a prototype ready for feedback on Friday. That prototype won’t be a fully functional beta version of a product, but a bare-bones version of what we’re hoping will be a significant technological development for diabetes patients will be available for consumer review. If you want to participate in Friday’s webinar you can register here, or if you’d like to learn more about the Design Sprint process you can read about it here.